Michael Rohde’s works are the result of a process that starts with a question, “What if?” Subtle changes in color and yarn create works that become meditative objects that delight the eye and capture the imagination. He is inspired by color, by geometry and the unpredictable nature of color relationships. Seeing him at work seated at a large loom, recalls an image of an organist exploring the intricacies of a Bach fugue. 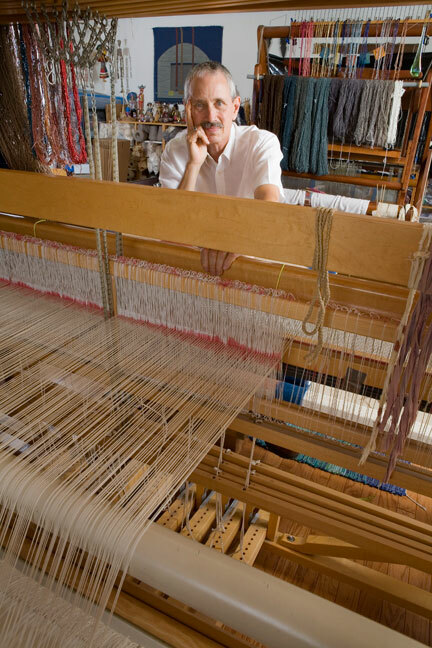 Rohde has been weaving for more than thirty years. He was trained as a bio-chemist and for a number of years pursued a science career while at the same time becoming increasingly curious about how various yarns behaved on the loom, and how slight variations in dyes could create a different emotional and aesthetic impact. About 20 years ago, he began to dedicate himself only to weaving. Rohde’s success is witnessed by the numerous awards he has received and by exhibitions in this country and abroad. His work is in the permanent collection of The Art Institute of Chicago. Michael Rohde’s documentation took place in 2006 and was sponsored by Jim and Meg Easton. The FOTM Archive contains extensive information about this artist.